Soooo it is bonfire night, Guy Fawkes night, fireworks night, whatever you want to call it and I have a love hate relationship with this time of the year! Part of me always feels very excited when the firework displays are being advertised absolutely everywhere, but at the same time it also feels me with dread because my dogs hate fireworks and it causes them to feel very unhappy in our home and they're unable to settle! The worst part about bonfire night is also how it isn't just for one night, it's for a good week or two and you find the random homes setting off fireworks at the most ridiculous times! 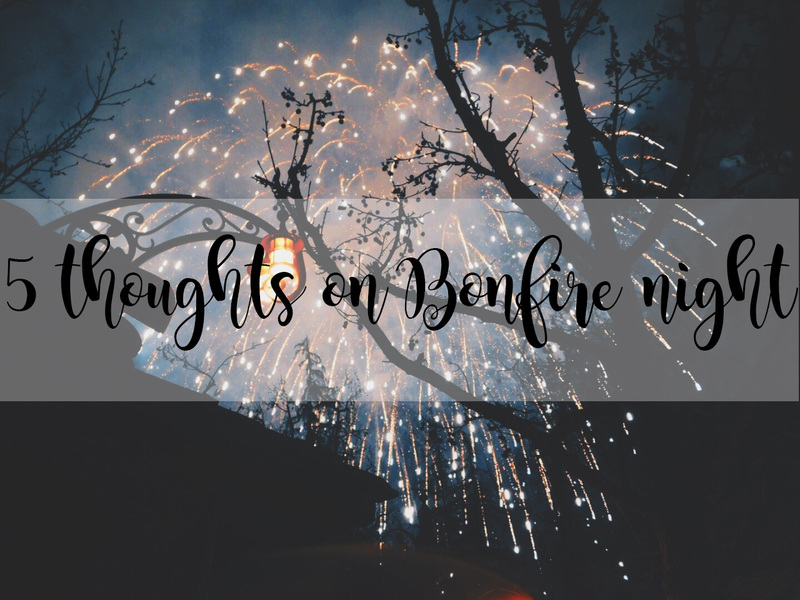 So today I am going to be sharing with you five thoughts I have on Bonfire night. Why does this one day event last for at least two weeks? One thing which really bugs me about Guy Fawkes Night/Bonfire Night is how it isn't just one simple display in every town/village or city on the 5th November, it is every single evening for at least two weeks. As well as this, these displays aren't just in every neighbourhood, but they're in everyone's back garden too. It's too much! When you have fireworks going off here there and everywhere, it isn't a nice experience which we all wish for, it's just irritating and noisy! Why do people set fireworks off at 11pm-1am at night? Not only do the fireworks last for two weeks, but you have the inconsiderate people who set fireworks off at 11pm-1am during the night. Why do people do this? Okay it might look a lot prettier as the sky will literally be pitch black, but people sleep and people have jobs as well as animals; it's not fair to keep them awake by setting off fireworks just because you feel like it! Why are the displays so expensive? So in the area where I live fireworks displays vary between 50p to get through the entrance and £15 per person. Why is this? Why do some displays only ask for a small donation, but some ask for a whopping £15 each? And I've found the ones which charge the highest amount are usually the rubbish displays too which have fireworks for only 5 minutes. A con if you ask me. Why couldn't Guy Fawkes have done all of this in the Summer? Last but not least, why couldn't Guy Fawkes have done his business in Summer instead of Autumn? It is far too cold to be standing outside for a long period of time in the evening when it's very close to being in the minus degrees. Although I can wrap up in as many clothes as possible, this still isn't enough and my finger tips and toes still end up going numb. I can imagine bonfire night would have been beautiful in the summer evenings at 9pm in the evening! What are your thoughts on Bonfire Night?